That mass of dead, leafless culms seems like a terrible place to raise chicks, but the other day I saw a nest about four or five feet from the ground. A female cardinal almost perfectly camouflaged, except for the brightly-colored beak. Really an excellent choice I think -- look at all of that brown! If I can't see you, you can't see me, right? 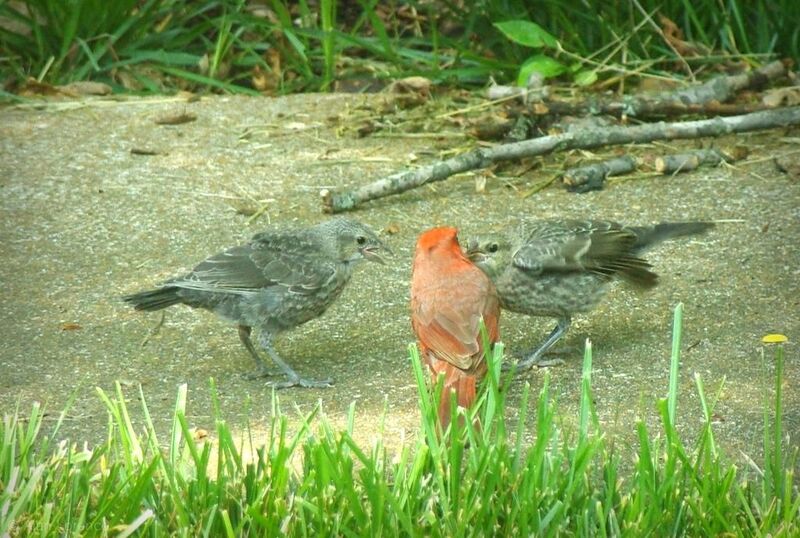 I'm hoping the cardinals will actually be raising their own chicks this year and not cowbird offspring like I saw last year. 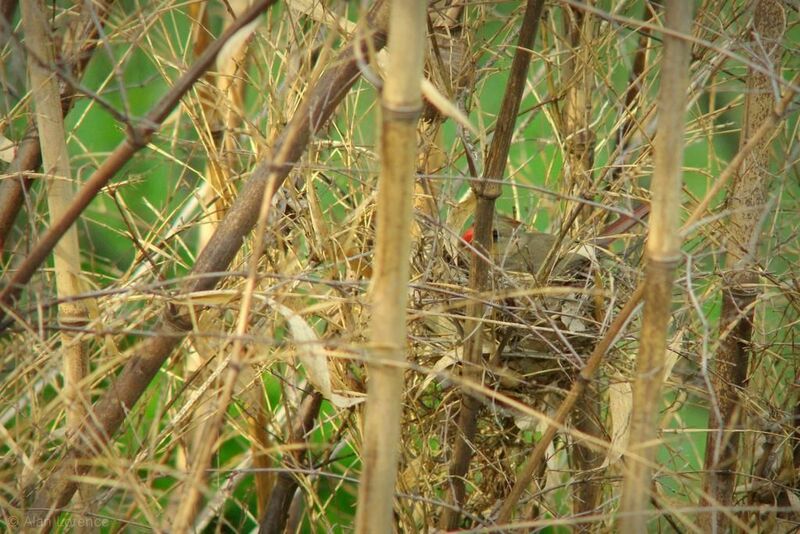 With at least two nests in the garden chances are good, right? 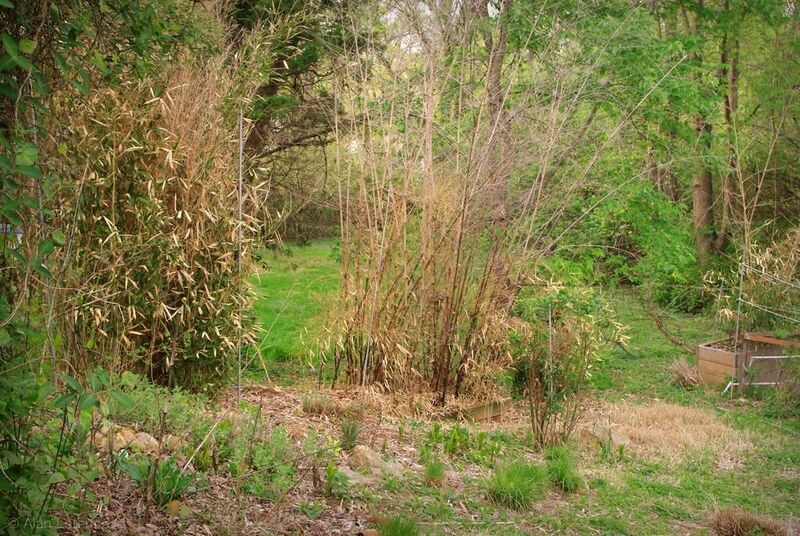 I'm surprised they opted for that spot seeming as bamboos sway but they do look content there. 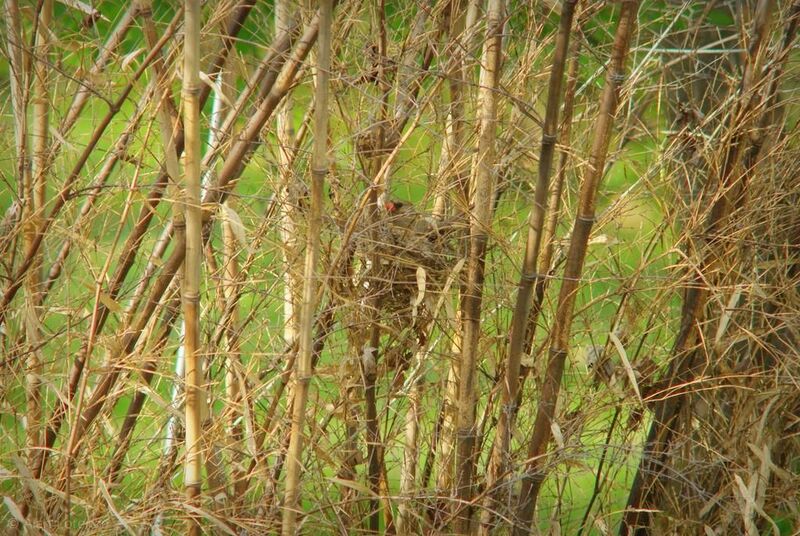 I hadn't realised anything nests in bamboo. Indeed in a clump like this I would have (wrongly) assumed a nest would be exposed and obvious. But the stalks (stalks?) of the bamboo must also act like metal bars between birds and predators. I thought cardinals nested in pine trees like blue jays. I'm surprised the nest is so low to the ground like some robins I've known. Like don't they know about cats? Wow, p nigra looks damaged pretty badly. That's looking much worse than any of my bamboos after the tough winter, but the tarps definitely blocked out a lot of the potential damage. My P nigra has hardly any leaf burn at all after a brutal winter so I'm interested in seeing how big it gets next month with shoots. 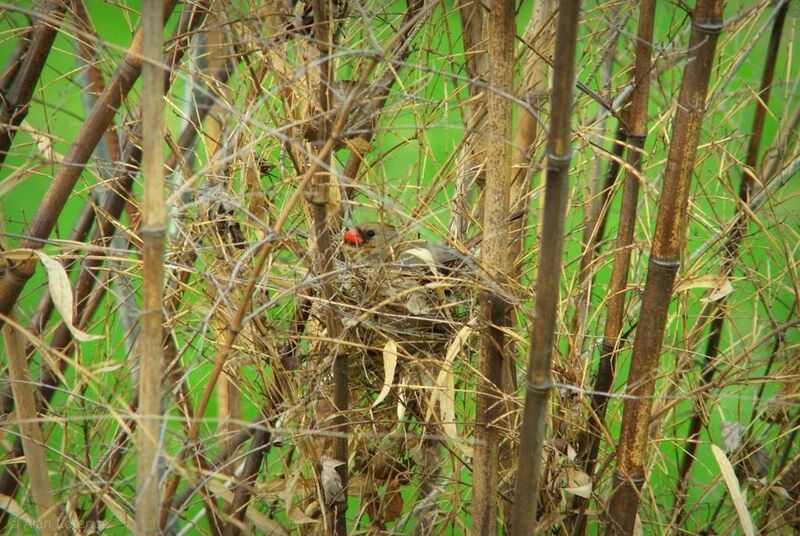 There are so many bird nests in my bamboo: grackles, robins, and cardinals are the ones that I'm sure of, and there may be more. Maywyn: I'm also surprised that both cardinal nests are so low to the ground! Steve: if you get that sizeup you're hoping for, you won't be able to tarp and then you'll get topkill like I did. Two years in a row, so this species is being removed. Wow! Two cardinal nests! You lucky pup. 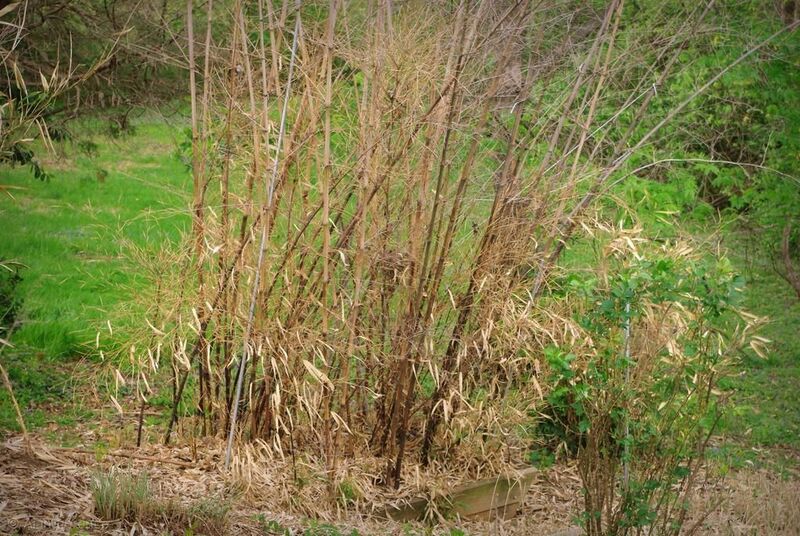 Sorry that the black bamboo didn't make it through winter for you. Some birds build their nests in the strangest places.